As one album reviewer put it, The Flaming Lips have never backed away from a good collaboration (2009's The Flaming Lips Doing Dark Side Of The Moon). 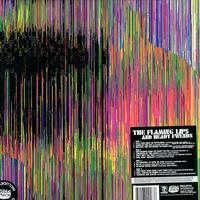 This new album is 13 songs by the Flaming Lips in conjunction with a Who's Who list of some of the best-known names in contemporary, pop and alt-rock. Some strange pairings? Naturally. Who wouldn't scratch their heads at the prospect of The Flaming Lips and Ke$ha? Or The Flaming Lips and Erykah Badu?